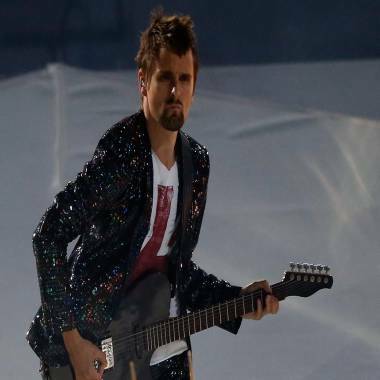 Matthew Bellamy of Muse performs during the Closing Ceremony of the London 2012 Olympic Games on Aug. 12. It looks like Muse is facing some legal resistance. The British rockers have found themselves at the center of a $3.5 million lawsuit filed by a songwriter against Warner Music Group claiming Muse ripped off his concept for a sci-fi rock opera about the destruction of earth and humanity's quest to save itself for their three-part symphonic suite they dubbed "Exogenesis." According to court documents obtained by Courthouse News Service and filed in federal court in Manhattan, Charles Bollfrass claims he pitched the trio, as well as two other unidentified bands, his idea in 2005, which he also called "Exogenesis." However, the composer was informed they weren't interested. Muse however subsequently unveiled "Exogenesis Symphony," the last three tracks on their most recent record, 2009's "The Resistance," which is comprised of the tracks "Exogenesis: Symphony Part 1 (Overture), "Exogenesis: Symphony Part 2 (Cross-Pollination)" and "Exogenesis: Symphony Part 3 (Redemption)." All three songs were credited to the group's principle songwriter, singer-guitarist Matthew Bellamy. Per Bollfrass, the band subsequently used the composer's story as the basis for their version, which "The Resistance's" liner notes described it as "humanity coming to an end and everyone pinning their hopes on a group of astronauts who go out to explore space and spread humanity to another planet." Bolfrass also accused Muse of pilfering an image from the storyboards of his rock opera and he's suing Warner for copyright infringement, unfair trade practices and unfair competition. In a statement to E! News, the band denied the allegations. "The claim is complete nonsense, and is categorically denied. It appears to be based on a 'screenplay' which the band never received or saw, produced by someone the band has never heard of. It speaks volumes that the album in question was released a full 3 years ago, and yet this is the first that has been heard of these groundless allegations," said Muse's rep. The rep added that Warner Music "will aggressively defend this lawsuit and the band is exploring what remedies may be available to them in the U.S. in relation to these untrue and baseless allegations." Muse's new album, "The 2nd Law," hits stores Oct. 2.